A newly published study details how researchers used a processed called durotaxis to move water droplets. The finding may reveal more about contrast between cell and liquid durotaxis and yield advances in microfluidics, micro-scale fabrication, and the development of effective coatings. Researchers have found a way to drive water droplets along a flat surface without applying heat, chemicals, electricity, or other forces: All that’s required is varying the stiffness of the surface in the desired direction. The droplets, it turns out, prefer the soft spots. “Our findings show that simple physical parameters, like the surface tension of a liquid droplet, can drive spontaneous motion from one stiffness to another,” said Eric Dufresne, associate professor of engineering at Yale University and principal investigator of a study published the week of June 24 in the journal Proceedings of the National Academy of Sciences. The researchers’ approach was inspired by the behavior of living cells. Certain biological cells are known to detect and move along stiffness gradients in a process called durotaxis. While eukaryotic cells migrate toward harder surfaces, researchers found that liquid droplets move toward softer ones. While the contrast between cell and liquid durotaxis is not yet well understood, the Yale discovery may reveal more about the general phenomenon. The new research could also yield advances in microfluidics, micro-scale fabrication, and the development of effective coatings — all of which benefit from the control of liquids. Liquid durotaxis could provide a basis for developing more energy-efficient cooling systems in particular, according to the researchers. The experiments involved spraying glycerol droplets onto flat surfaces with gradients in softness and thickness and observing them using a light microscope. 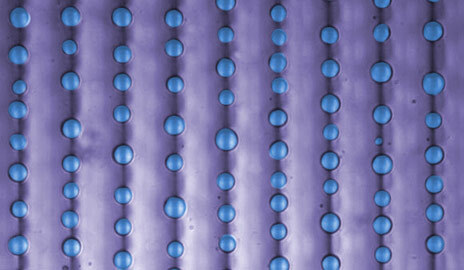 In all, researchers measured and documented the movement of 13,300 droplets. They found that droplets spontaneously moved from stiff regions to soft regions, and they exploited this tendency to lure droplet droplets into patterns, including a Y. The paper, “Patterning droplets with durotaxis,” includes a complete list of authors, including John Wettlaufer of Yale. Yale University, the Swedish Research Council, the National Science Foundation, the Ministry of Education, Science, and Technology/National Research Foundation of Korea, the U.S. Department of Energy, and Zygo Corp. provided support for the research. Be the first to comment on "Researchers Control Water Movement by Varying Surface Stiffness"